The remains of this gatehouse to Furness Abbey can be found to the South West of the abbey remains, and consists of two upstanding portions of a building either side of the narrow road, and a low wall running to the North West and the South East. 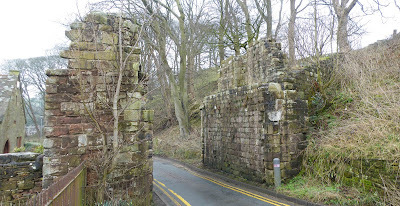 This would not have been the main entrance into the abbey precincts, but a lesser gateway. The main entrance was to the North of the abbey and is not shown here. Above. 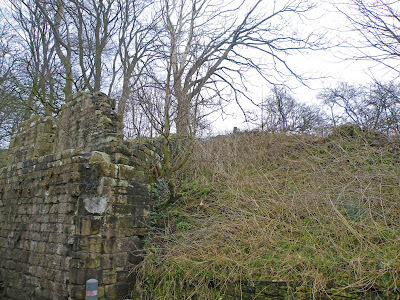 Looking North East through the remains of the gatehouse. The gatehouse appears to have consisted of a simple building through which traffic would have passed, impeded by doors at each end of the thirty foot building (as evidenced by jambs on the external and internal walls) There doesn't appear to be any evidence for rooms built into this gatehouse....it looks as though it was a simple postern type structure, providing another way in and out of the abbey precincts. Above. Looking South West through the gatehouse. The precinct wall can be seen running to the left of the photo. 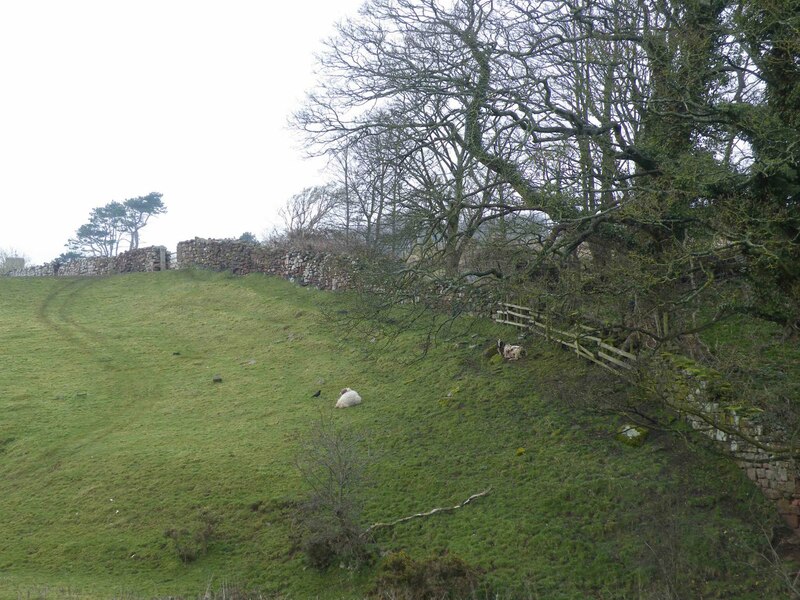 As shown in the image above, the precinct wall still survives to a height of around five feet on the left of the photo, as it disappears up the hill. Above. 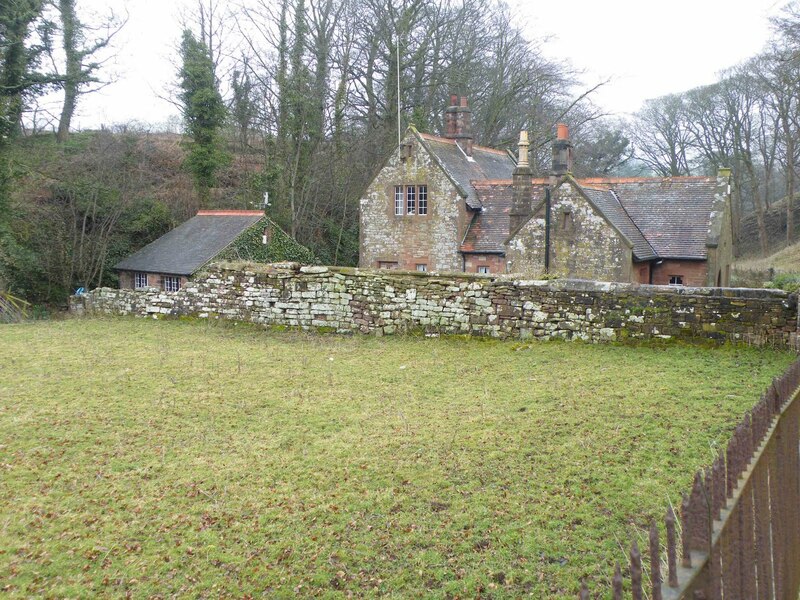 The precinct wall can just be seen emerging from behind and above the gatehouse wall. The precinct wall shown below, survives to a height of around four feet immediately behind the house, but as it continues into the dip to the left of the photo, it drops to around three feet and is not in particularly good condition. Above. The precinct wall, both repaired\rebuilt and possibly original running to the North West. In the image below, two distinct phases of building can be seen in the wall. A newer, rebuilt wall runs from the right of the photo, from the gatehouse wall, behind the house and to about half way across the photo....then an older portion of wall can be seen. This continues out of shot to the let, and quite possible represents all that is left of the original wall. Above. 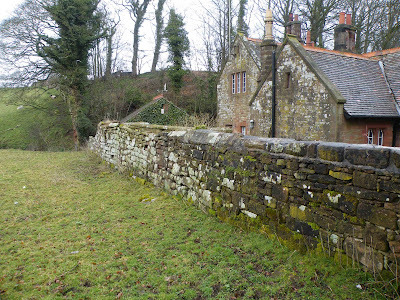 Another view of the precinct wall running from the North West side of the gatehouse. Above. 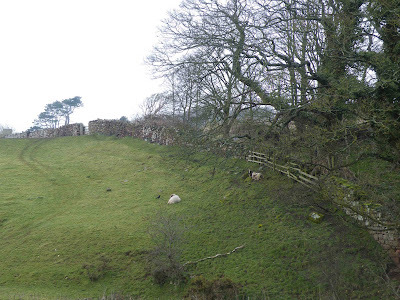 The precinct wall can be seen running over the brow of the hill. The wall in the above photo, is in such poor condition in places that it appears to have vanished in a few places and has been replaced by fencing. 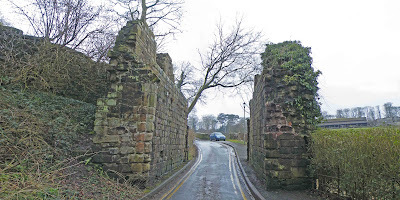 The best view of the walls are from the gatehouse to the South West of the abbey, whilst the gatehouse can be viewed from the road down towards the abbey car park.